A successful marketer is the one who spends efforts for creating buying modalities. This blog concentrates on using 10 x 14 magnets for creating persuasive buying modalities. Here is this blog mapping each of the above-mentioned types with vast and large 10 x 14 magnets. Competitive buyers are similar to Tony Stark, who, who is smart. They always love to access their preferences before making a buying decision. You can address such buyers by presenting a clear value proposition. Full color logos are most important value elements, which will add conviction to the advertisement. Along with it, marketers can add some interesting quizzes and assessment points. The main advantage is that customers would love to retain such interesting promotional material over their refrigerator doors for a long time. They would certainly get drawn towards such advertisements. Spontaneous buyers are impulsive buyers and they usually don’t think about pros and cons. Heart rules over mind, whenever an impulsive buyer makes buying decisions. Marketers targeting impulsive buyers can use 10 x 14 magnets for creating advertisements, which offer lucrative guarantees, element of scarcity (read urgency) and directional messages. Methodical buyers are people who expect a systematic flow through processes. Marketers can employ 14x 10 magnets for presenting systematic buying processes with step-by-step instructions. They can supplement it with a promise of superior after services and believable testimonials. Take care to avoid fluff and generic claims, rather focus on real sounding elements. Marketers can enrich their advertisements by adding some credibility elements. Humanistic buyers are people driven by emotions. Humanistic buyers would appreciate little personalized approach to sales information. They would enjoy information, which allows them to personalize their experiences. Adding website URL or informing about a FB page or Twitter Account can be helpful. 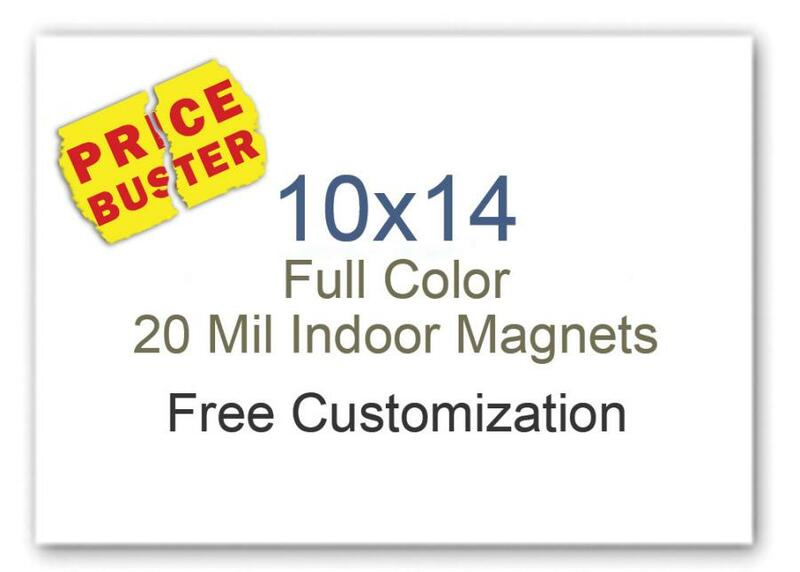 Marketers can employ 10 x 14 magnets for creating emotionally enriched sales copies. In addition, they can use it to show their association or inclination towards some grave social issue. It takes little efforts and the minimum investment to excel in campaigns drawn over customized magnets. By seeing dimensions, you might have understood that such large personalized magnets are only available in eCommerce stores stocking made in USA magnets. Lowest price match guarantee, free online design proof, free shipping, free art setup, and free full color printing are some features offered by these stores.